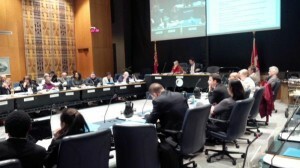 The current “consultation” on the governance of the TDSB is unprecedented. 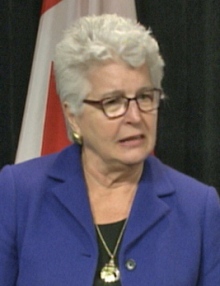 The appointed panel headed by former mayor Barbara Hall is looking at the governance model for only the Toronto Board and no other board in the province. These public consultation meetings are run by the public relations firm GSI. There are many problems with this process. The locations of the consultation meetings are often in places removed from school communities. (College campuses among others.) There are 22 school wards in Toronto and there are only 17 meetings. The meetings should have been set up in each school ward and within the respective school communities preferably in schools or other easily accessible facilities. To date, two meetings have been either postponed or folded into another scheduled meeting. The web-site for on-line information is hard to find. You must be aware of the meetings and you must search for the URL. Once found, the information is posted in English only. The on-line survey consists of nine questions for your input. Many are phrased in a negative way. This could result in negative answers. The Ministry of Education had input into the questions. The meetings are tightly structured. Only three of the nine questions asked in the survey are covered. The same three questions are asked at each meeting. Those assembled are encouraged to look at other models of governance such as appointed trustees. You are also informed that this procedure is not to deal with funding. People are seated at tables for these “Conversation Cafes”. The table has a large piece of paper on it that contains a question. Answers are written on post- it -notes which are placed on the larger paper. The post- it -note remarks are voted on by the table and the answers with the most votes are placed under themes on a large surface for everyone to see. Attendees change tables for each of the three questions. A summary of the answers is given orally at the end of this process. At the end of the meeting, a short period of time is given for remarks from the participants. There is a lack of translators and/or facilitators who reflect the diversity of the city. Why the tightly structured process? How were the locations for the daytime meetings chosen? Why are there no translators? What was the process for advertising the meetings and the web-site? Why are there no minutes of these meetings posted so the public can see what was recorded and said? 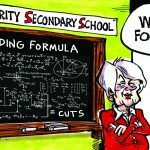 Why wasn’t the administration of the Board investigated? What input will be more heavily weighted phone calls, survey results or public meetings? Just how independent is the panel?